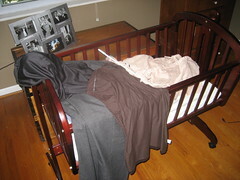 I ordered this cradle online, several days before Sophie was born. 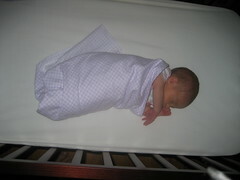 It was waiting for us on the front porch when we came home from the hospital, three weeks earlier than planned. Andy ran out to buy some things we needed and didn’t have, things we planned on buying later that week. I remember sitting on our bed, holding Sophie and feeling terrified. And then, I had to pee. Later that evening my parents came over with dinner. Andy came back with lots of (pink!) receiving blankets, preemie clothes and cradle sheets. They calmed me down. My parents made up the crib. Andy put the cradle together. Sophie now had places to be placed when I had to pee. But now it’s time for the cradle to be broken down and put away. 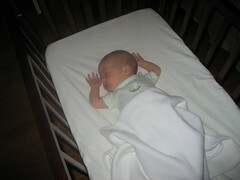 Sophie spent her first two months in that cradle. And I spent her first two months picking her up and putting her down in that cradle, so many times in the middle of the night. I’d rock her in her cradle while half-asleep in bed. When I took showers I would roll her cradle right up to the bathroom door so I could peek from behind the shower curtain to make certain she was alright. “She’s growing up so much,” I said to Andy last night, while we were putting Sophie to bed. “That’s good,” he said. “You want her to.” And he’s right. But for so long I wanted a baby. And now I have one who is too old for a cradle. 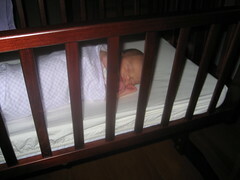 It’s hard to believe that someday I’ll have one who is too old for a crib. This entry was written by kara, posted on August 20, 2008 at 6:50 pm, filed under Uncategorized. Bookmark the permalink. Follow any comments here with the RSS feed for this post. Post a comment or leave a trackback: Trackback URL.